Prospect United Methodist Church of Dunlap, Illinois, was formed by the merger of the Methodist Church and the Prospect Presbyterian Church. Both churches had long contributed to the life of the Dunlap community, and their histories serve as a solid foundation for Prospect. The Dunlap Methodist Church dates back to 1884 when the Methodist Minister at Kickapoo, traveling by horseback, began holding services in the Grange Hall. It soon was decided that a church should be built. A committee consisting of the minister, Rev. George A. Weber; John Jackson, Sr.; Malon Brassfield; and John Potter, Sr. was formed. Work on the building progressed quickly, and the Dunlap Episcopal church — located at the NW corner of Third and Elm — was dedicated Sunday, November 2, 1885, under the direction of Rev. Weber. The Dunlap Methodist Episcopal church was ably served not only by resident ministers but also by student ministers. In 1927, student Frank Davies was assigned to Dunlap and Edwards, which were connected at the time. After Davies had completed his ministerial studies, he married and served as a missionary in Chile and Peru. His successor, a student named Cecil Lockard, served the Dunlap Church until his graduation from seminary in 1931. In 1936, the Dunlap Methodist Episcopal Church was connected with the Princeville Methodist Episcopal Church. The minister, Rev. Austin A. Rodgers, lived in Princeville. Under Rev. Rodgers' leadership, work on expanding the church's facilities began in January 1938. They added a basement with a kitchen and new space for Sunday School classes and social activities. The renovations also included the installation of a new furnace, refurbishing the auditorium, and painting the building's exterior. All the work was completed by volunteers and culminated with a dedication on May 15, 1938. Church membership was 156 at this time. It was in 1939, during the pastorate of Rev. Rodgers, that the church became The Methodist Church, which was the result of the union of the Methodist Episcopal Church, the Methodist Protestant Church, and the Methodist Episcopal Church South. From 1936 until 1962, the Dunlap Methodist Church continued to be connected with the Princeville Methodist Church. In 1962, resident minister Rev. Roy Doll was appointed to the Dunlap church. As the membership grew and its activities increased, the need for a larger church building became apparent. Members of the Prospect Presbyterian Church and Dunlap Methodist Church discussed the possibility of combining forces to build a new church. Their dream was realized on May 22, 1963, when the two churches merged. In 1970, the deteriorating church building was torn down with the bell being removed and placed in front of Prospect United Methodist. In about 1848, Presbyterians who had mostly settled here from the panhandle of West Virginia would drive by horse and buggy to Princeville for church services. Later, they began holding services conducted by visiting ministers in a rural schoolhouse at a site east of the first corner north of what is now the town of Dunlap. An application was made to the Presbytery to organize a church and was granted. A committee consisting of Rev. Addison Coffee of Peoria, Rev. Robert Breese of Princeville, and Elder Henry Schnebly of Peoria was established. On June 8, 1850, the committee met the congregation in the schoolhouse and the organization was accomplished. Before the church was organized, many names were discussed. Dr. Yates remarked, "We have nothing yet to name, for our church is yet in prospect." Whereupon the name "Prospect" was unanimously chosen for the new church. As the congregation grew, there was need for a larger building. Adam Yates donated about five acres of ground from the southeast corner of his farm north of Dunlap for the site for Prospect Presbyterian Church and Prospect Cemetery. (After the merger of Prospect Presbyterian Church and Dunlap Methodist Church, Prospect Cemetery ceased to be under the church's jurisdiction). The lumber for the church was sent from Chicago canal boat to Chillicothe, which was hauled to the building site by men of the congregation and their teams of horses. The church — originally 36 x 48-feet — was completed and dedicated in June 1854, four years after the organization of the congregation as Prospect Presbyterian Church; it cost of $1,400. In 1867, thirty acres just east of the church were purchased and a house for the minister built there. Worship services were held in the church north of Dunlap until 1877, after which they were held in a new church edifice in Dunlap. The lot was partly donated by the town's founder, Alva Dunlap, and the new building at the NE corner of Third and Birch cost of $5,100. The church was dedicated during the pastorate of Rev. John Winn. In 1878, the parsonage, along with its thirty acres, was sold and the proceeds applied to the cost of a replacement erected a block west of the new church in Dunlap. Around 1891, during a Sunday evening service, a cyclone lifted the tall spire from the roof top. As the congregation grew, more room was needed for church activities. To fulfill this need an annex was built in 1919. The celebration of the 100th anniversary of Prospect Presbyterian Church was held June 9-11, 1950, during the pastorate of student minister Rev. Marion Floyd. He and his wife lived in Dunlap while he completed his courses at McCormick Seminary. The last of the many ministers who served Prospect Presbyterian Church before the merger was Rev. Paul Jassimides, who served October 1956 to October 1962. The following year, Prospect Presbyterian Church merged with Dunlap Methodist Church. In July 1967, the Prospect Presbyterian church was sold to Dunlap High School for $9,500. In June 1973, the high school sold the remaining contents of the church for $588 and had it demolished. One of the 19 stained glass windows was donated to Prospect United Methodist. On Pentecost Day, May 22, 1963, the church to become known as Prospect Methodist Church was formed. On that Sunday, the congregations of the Dunlap Methodist Church (180 members) and the Prospect Presbyterian Church (207 members) voted at their respective churches to unite. Following the voting, the two congregations met on Third Street at the midway point between the two church buildings and celebrated the union by singing "Blest Be the Tie That Binds" and the "Doxology." During the early years of the new church, both church buildings were utilized. Worship services were held in the south church (Prospect Presbyterian Building), and Sunday School classes were held in both the south and church (Methodist Building) locations. The Pastor's office was located in the annex of the south church. In 1966, the Prospect Presbyterian parsonage was sold, after which worship services were held in the north church along with some Sunday School classes. The other Sunday School classes were held in Dunlap High School (now Pioneer Junior High School). The pastor's office was moved to a room in the Phillip's 66 Service Station on the corner of Route 91 and Birch Street. The search for an appropriate site for a new church building led to the 1966 purchase of the W.R. Wiley estate consisting of just over 23 acres of land. Later, all the land except just over four acres retained by the building site was sold. The ground-breaking occurred on April 21, 1968, with the first shovelfuls of dirt being turned by two of the older members of Prospect Methodist Church: Mrs. Alice Campbell, representing the former Dunlap Methodist Church, and Dr. Clausen Wilmot, representing the former Prospect Presbyterian Church. The estimated cost of the new church was $252,000. On April 23, 1968, the Evangelical United Brethren Church and the Methodist Church united to form the United Methodist Church. 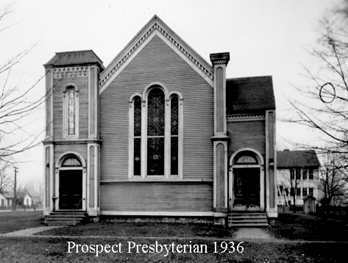 Because of this union, Prospect Methodist Church became Prospect United Methodist Church. On November 9, 1969, the cornerstone was placed in the new building under the direction of Rev. Philip Richardson. On December 7, 1969, the first worship service was held in the sanctuary. The Consecration Service for the new building was held December 21, 1969, with Dr. Harry Crede, Superintendent of the Peoria District, and Dr. William Bennett, Assistant to the Bishop, Central Illinois Conference, participating. ln 1972, the James White property next to the new church property on Ash Street was purchased for a parsonage at a cost of $32,500. The old Methodist parsonage and the two adjoining vacant lots were sold. In October 1982, a new organ was added to the church. On November 20, 1983, a dedication service was held under the direction of Dr. Follis and Dr. Miley E. Palmer, Peoria District Superintendent, to burn the mortgage and dedicate the church building. In February 1993, a committee was formed to begin work on expanding the church. The plans included the addition of a fellowship hall, kitchen, pantry, new offices, lounge/library, four Sunday School classrooms, ADA-compliant restrooms, a larger narthex, and more parking. The ground-breaking ceremony was held in October 1994, and on June 4, 1995, the addition was dedicated with a consecration potluck dinner. To address the growing population within the Dunlap area, another renovation was commissioned in 2006. Ground was broken for the improvements on April 7, 2007. The addition included expanding the sanctuary and narthex at the front of the church, adding more classrooms on the lower level, installing an elevator, and upgrading the HVAC system in the older part of the church building.